In Episode 2, Stevie and Ana talk Encounters. 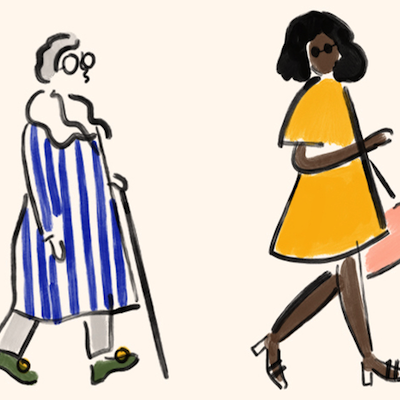 A fleeting glimpse of a stylish stranger while on holiday, an ongoing friendship with the woman who works in the local boutique, or bumping into an enigmatic stranger in a Soho club: often it’s the chance encounters we have that can really influence how we think about clothes. Stevie makes a new friend, and Naomi Shimada tells us about her solo travels in Argentina. Sophie Davidson talks getting dressed for a memorable blind date. Ann-Maria McCarthy tells us of a vintage friendship, and Ana has a round-table on make-up and growing up with her school friends. Finally, the latest Loved and Lost segment comes from fashion journalist and erstwhile party reporter Osman Ahmed. The British Red Cross charity shop is on Old Church Street, just off the King’s Road. You can visit the Sir John Soane-designed St Peter's Church in Walworth. It's at Liverpool Grove, London SE17 2HH. Ann-Maria Mccarthy is on Instagram at @annmariamccarthy. The wonderful Jenny Vander is at 50 Drury Street in Dublin. Osman Ahmed writes for Business of Fashion. If you liked this episode, please rate and review us on Apple Podcasts!